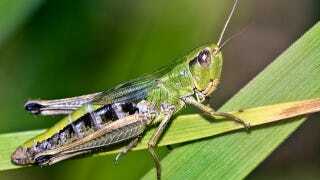 That's according to German researchers, who compared the mating sounds of male bow-winged grasshoppers between those captured near busy roads, and those from the quiet countryside. "Increased noise levels could affect grasshopper courtship in several ways. It could prevent females from hearing male courtship songs properly, prevent females from recognising males of their own species, or impair females' ability to estimate how attractive a male is from his song." This marks the first time that insects have been observed changing their sounds due to anthropogenic noise — so the question now is if this happens with other insects, and what effect it has on them.